Information literacy has been given many definitions by various organisations. It is perhaps simpler to define the characteristics of an information literate student, who “accesses information efficiently and effectively, evaluates information critically and competently, and uses information accurately and creatively” (Byerly/Brodie, 1999, in IFLA, 2006). 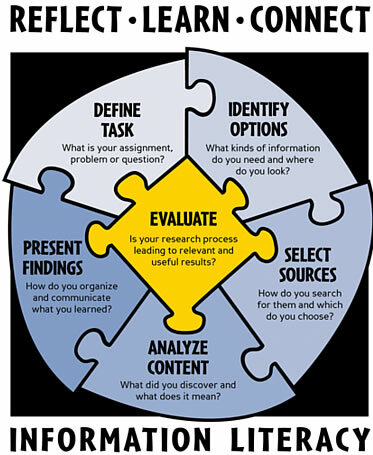 Information literacy is also known by many other names, such as digital literacy, information skills, and research skills. With technological changes that have occurred in the past decades, information has become more important than ever as a deciding factor in global affairs. Economically, information is now worth more than any other commodity. At the same time, the amount of information produced has led to information overload – it has become increasingly difficult to find the information needed in the vastness of the internet. Information literacy provides the intellectual tools that are necessary to function both personally and professionally in any area. For example, a plumbing student at the College might use information literacy skills to find the best deal on a holiday in Spain, or to source the cheapest components for his next project. Clearly, these skills will have been used when he was doing the research for his last assignment too. They are the same skills, applied to different areas of his life. Information literacy has thus been recognised as a vital skill internationally, with IL programmes in Scotland, Wales and the US, for example. Information literacy provides the tools for students to become truly independent learners, and it supports critical thinking skills which are intrinsic to lifelong learning. Students are able to apply the skills they have learnt to finding out more about any topic, which means they can adapt to any circumstances. How Do We Support Information Literacy? The library is the natural home of information literacy at the College. As an information professional, the librarian can offer expert advice and support to staff and students who would like to improve their skills in this area. We currently offer a range of bitesize infoskills sessions which can be combined into longer lessons depending on what the teacher and students require. For more information, please take a look at our IL Menu.